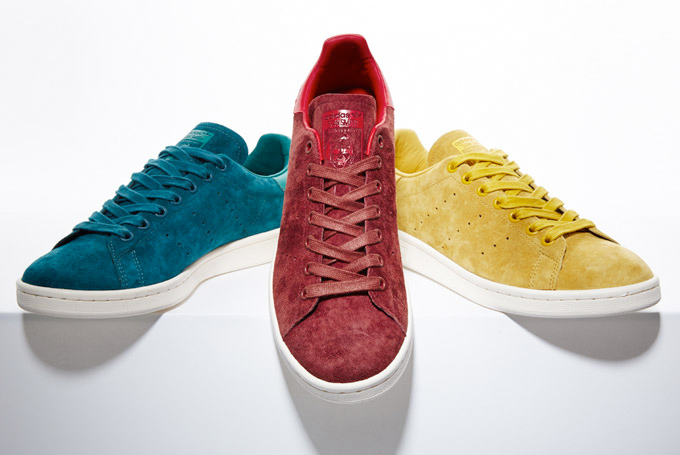 adidas definitely played it right with the Stan Smith. We never even knew it had been withdrawn from sale in its original form to preempt its resurrection until somebody told us, because we’d seen so many themed version of the damned thing that we thought we could do with a time out. But after a chat with Gary Aspden around the time of the Spezial exhibition last summer we discussed just how well this shoe goes with any outfit, any gender and how good it looks in any condition. adidas have played the reissue game well with its improved shape and fit and with the impending Raf Simons editions and their presumed role in projects being planned, that’s set to escalate. We still prefer to see a shoe that our friends in the north popularised back in the late 1970s and early 1980s and — around the same time that US-made editions dropped with red uppers, black uppers and blue uppers — according to tales from those who were there, oneupmanship by dyeing a pair occurred. So this classic isn’t bound to the pristine white that we often see it in and these suede versions invert the usual suede or nubuck heel and leather upper to make it fully suede with a leather heel. Of this trio (which arrives shortly and uses some colours that are a b-boy standard — word to Footpatrol), the mustard editions are our personal favourites because they embody the class that Stan represents but stay true to a certain b-boy elegance too (just lay off the fat laces though). Oft imitated but never bettered. We see your perforated 1970s silhouettes, but this one’s always gonna be better and if adi refrain from lapsing into the silly stuff again, it should stay immortal.